The IBM® Linear Tape File System™ (LTFS) is the first file system that works along with Linear Tape-Open (LTO) tape technology to set a new standard for ease of use and portability for open systems tape storage. In 2011, LTFS won an Engineering Emmy Award for Innovation from the Academy of Television Arts & Sciences. 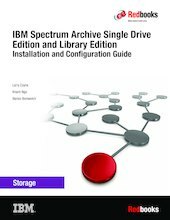 This IBM Redbooks® publication helps you install, tailor, and configure the IBM Spectrum™ Archive Single Drive Edition (SDE) and the IBM Spectrum Archive™ Library Edition (LE) products. LTFS is a file system that was originally implemented on dual-partition linear tape (IBM LTO Ultrium 5 tape drives (LTO-5) and IBM TS1140 tape drives). Now IBM Spectrum Archive SDE and LE support IBM LTO Ultrium 8, 7, 6, or 5 tape drives, and IBM TS1155, IBM TS1150, and IBM TS1140 tape drives. IBM Spectrum Archive LE supports the IBM TS4500 tape library, IBM TS3500 tape library, IBM TS3310 tape library, IBM TS3200 tape library express, IBM TS3100 tape library express, and IBM TS2900 tape autoloader express. IBM Spectrum Archive makes tape look and work like any removable media, such as a USB drive. Files and directories appear on the desktop as a directory listing. It is now simple to drag files to and from tape. Any application that is written to use disk files works with the same files on tape. IBM Spectrum Archive SDE supports stand-alone drives only. IBM Spectrum Archive LE supports tape libraries. IBM Spectrum Archive LE presents each cartridge in the library as a subdirectory in the LTFS file system. With IBM Spectrum Archive LE, you can list the contents and search all of the volumes in the library without mounting the volumes by using an in-memory index. This publication is intended for anyone who wants to understand more about IBM Linear Tape System products and their implementation. This book is suitable for IBM clients, IBM Business Partners, IBM specialist sales representatives, and technical specialists.